FAQ – we know you’re busy! There is only one way to calculate payroll & pay the taxes, and that’s how HMRC tell you to do it. Our payroll manager was originally trained by HMRC officers, and we use the most comprehensive and up to date payroll software. With over 14 years of experience, we are an established (2005) company with good relations with HMRC. Hundreds of customers trust us with their payroll every month. We have built a strong reputation through accurate and efficient work. How can your fees be so competitive? We are aware that some payroll companies are charging over £300 per annum and some accountants even twice that. So you may ask how can we offer a fully comprehensive payroll solution for small employer's at such a competitive cost? By agreeing to a fixed term contract of 12 consecutive months, you benefit from a complete, yet low cost payroll solution. We are a small team of payroll professionals (with low overheads) that can advise you on all statutory payroll matters. We do not pay commissions for referrals to nanny agencies, who work with some other payroll companies. 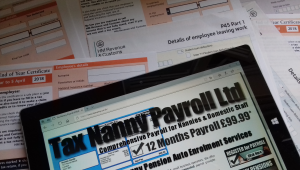 At Tax Nanny Payroll we are by design paperless and as such environmentally friendly. This further keeps our costs down, which we are pleased to pass on to you in the form of our low fees. Any months unused can be transferred to a replacement employee at no cost, at anytime during your 12 month contract. A monthly pay as you go option is available after your first 12 months for short term monthly extensions, if a further fixed contract term is unlikely to be required. We can produce your payroll and issue the payslips the same day (who else does this?) If you do not have a PAYE scheme we register you with HMRC. (this can take up to 28 working days to process online, or you can call HMRC for instant details) HMRC will post you your PAYE and accounts office references, or convey them over the telephone. In order for us to file your RTI online to HMRC, you must provide us these references as soon as you know them. What are your support times of operation? As we are primarily an internet service company, we prefer that our customers contact us online. This enables us to reduce running costs and keep our prices low for you. Telephone support is available direct from the payroll manager Monday to Thursday. Email only on a Friday up to 11am. Are you availabe Friday and at weekends? Emails received after 11am on a Friday may not be responded to until after 9am the following Monday (ex-public holidays) We are sorry but we do not provide any cover on a Staurday or Sunday. How do you support auto enrolment & pensions? What about online filing & RTI? We are registered with the government gateway. We have submitted online FPS & EPS since RTI started. (...actually before, as we provided a pilot scheme with HMRC) RTI is filed each month instead of filing data to HMRC only once a year. The payroll data will be sent to HMRC each time a payslip is produced if you advise monthly, or last working weekday if auto produced. Where, when and how do I pay the tax and NI to HMRC? Full details of the various methods and which office to pay can be found here. Each month or quarter (deafult is per quarter) we will email you a P30 advice note. This is the total amount of tax & NI (plus student loan if in force) that is payable to HMRC for that period. Payment of PAYE deadlines to HMRC are the 22nd of the following month as per below. As you are the registered employer, HMRC will write direct to you. We do not act as your HMRC agent or correspondence address. This is because it is more appropriate for you, the employer, to hold all the important HMRC data. If you get any communications from HMRC that we need to be informed of, you just email us a copy or provide the data using the online form.